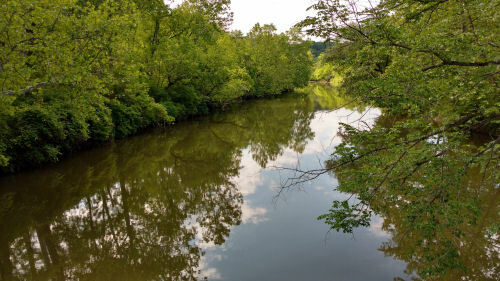 All early commerce and activity in this area was defined by the Cuyahoga River. 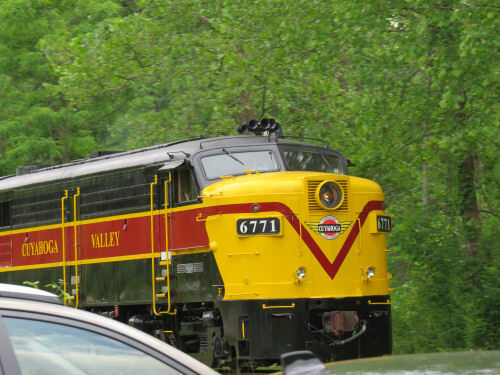 The next day, Thursday, we took off from hiking and rode the Cuyahoga Valley Scenic Railway. There were thunderstorms in the forecast and we decided to see those from inside a train instead of on a trail. It worked perfectly! The train goes the length of the Cuyahoga Valley National Park, along the same corridor as the river and the canal, well, and some roads. Naturally, these are all located in the easiest gradient to get from Lake Erie (573 ft) to Summit County and Akron (968 ft). That same day, after the train ride, the skies cleared and we also visited a small park we had found with this statue in it. 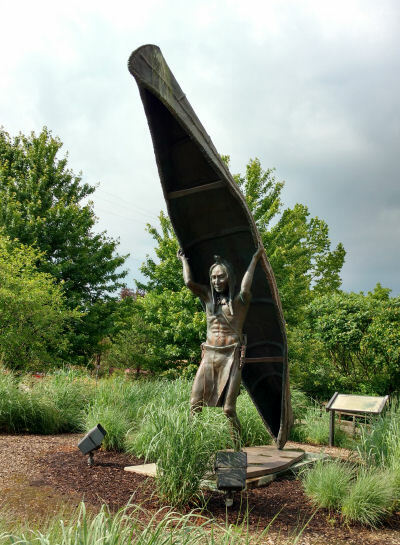 It marks one end of the Portage Path, the Native American route from the Cuyahoga River to the Tuscarawas River. The Tuscarawas flows south to the Muskingum, to the Ohio, and thus to the Mississipi and the Gulf of Mexico. With just an eight mile walk, you can pass from the St.Lawrence watershed to the Mississippi watershed! If we'd had another day, I would have walked that route. It's not really a trail, but there are markers along the way, mostly following roads now. After the hike was over, we also discovered a place to take a canal ride (only four places in Ohio) on a reconstructed boat at the town of Canal Fulton. The boat was towed by horses, not mules, but it was pretty authentic. The canal does not entirely follow the old Native American route even though it would have been shorter. However, the state capital at Columbus, is not along any of those rivers. So, mid state, the canal took a sharp turn to the west and went to Columbus before going south to the Ohio! There were 44 locks to raise and lower boats between Lake Erie and Akron, and more than 50 more to take it south and downhill to Portsmouth, Ohio, on the Ohio River. The steepest rise was approaching Akron on the north side and there were 20 locks practically end to end in stair-step fashion. 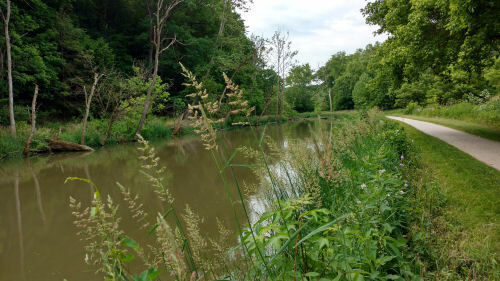 As an example of the economic impact of the canal, in 1826, the year before the canal opened from Cleveland to Akron 1000 bushels of wheat were shipped through Cleveland. In 1827 that increased to 250,000 bushels, and by 1840 it was 2.2 billion. Each canal boat could carry several tons of freight. 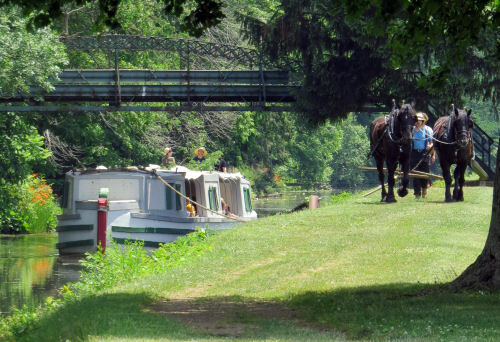 Everything from dry goods to stone to people traveled by canal. One interesting side note. I had previously realized that counterfeiting was prevalent in Ohio. I've come across many historic sites associated with that activity on my Buckeye Trail wanderings. But I hadn't realized it was a direct outcome of the success of the canals. There was this sudden explosion of economic activity, and not enough cash in the territory/state to cover the needs. Banks, companies, individuals printed their own paper money. Sometimes the fake stuff was worth more than what the banks printed. It's all about trust... then and now. Most of this hike from here on out will follow the canal towpath trail. Hiking day number six. We have now started south on the tail of the T from the triple point (that Buckeye Trail map on an interpretive sign). This day we did 10.4 miles. 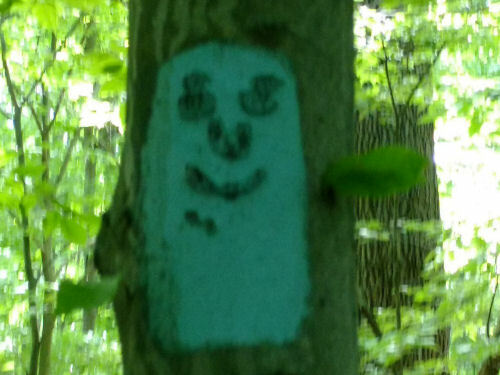 This was within Cuyahoga Valley National Park. These miles were not yet on the towpath trail, which defined the southern portion of this segment. So we enjoyed wooded trails, and more hills than we'd seen on other days. None were very difficult, though. This was a really interesting stream bed. 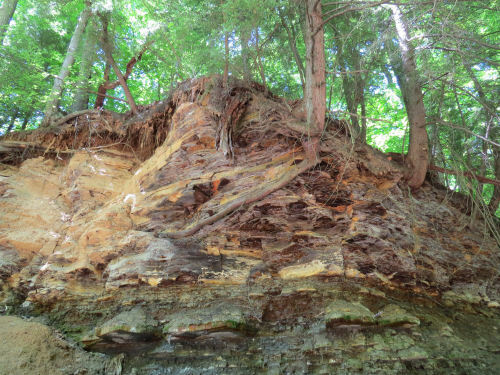 The trail dropped down to ford the creek and the banks were this two-toned clay and rock. I did put this picture on Facebook, but it was SO yummy, I have to share again. One of my shopping coups, pre-trip, was some large specialty crackers. We took pepperoni, mozzarella cheese and some salsa. Voila- instant trail pizzas. I'll have to watch for those crackers again. 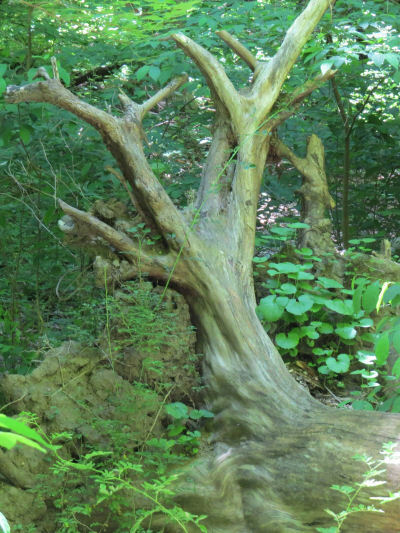 I liked this weathered tree that had fallen. It was smooth, as if it had been polished, and a terrarium planted between the roots. One of the best parts of the afternoon was Blue Hen Falls. 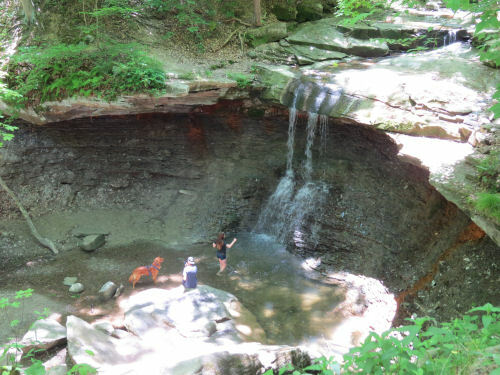 It's a small waterfall, but has a pretty good drop. You can see that people play in the pool. It's not deep enough, nor the water strong enough to be unsafe. The creek it's on flows into the Cuyahoga River, but I couldn't find out its name. 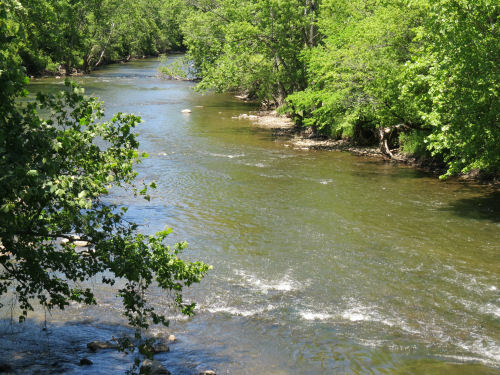 And just before reaching the trailhead, we crossed the Cuyahoga once again. It was an important transportation route, and I'll be doing a post about that later. 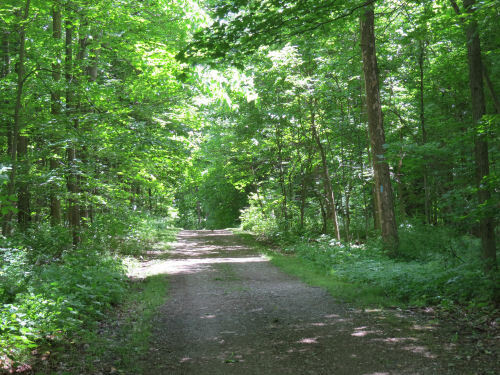 It occurred to me on this hike that I may be the first person to hike all of the North Country Trail, the Finger Lakes Trail, and the Buckeye Trail. I hadn't added up my Buckeye miles because I knew I had a lot to do yet and it was depressing. However, last night I did a spreadsheet with all the Ohio hikes, and my Buckeye total is 1219 miles, with 194 to go. That is very doable! Unfortunately, those miles are spread around in three different locations, because to get the Buckeye patch you have to do all the loops and spurs. But I'm encouraged. I want to finish it! Now. Too bad that's not compatible with working. Monday we went back and filled in the middle part of the top of the T. This was only 9.8 miles, so we knew we'd be done in plenty of time to meet the reporter. More on that later. We started from Shadow Lake, which we had walked around before, but I didn't take any pictures that day for some reason. I did talk to a man who was fishing. He was pulling in little sunfish just as fast as he could cast. As soon as the bobber hit the water it would disappear and he'd grab another one. We saw people fishing in nearly every little body of water we passed. The day was pleasant, mostly on bridle paths although there was one trail detour of two miles that we had to do on road we hadn't been expecting. Another hiker told us the trail really was closed where it went beneath I-271. The next time we came to a detour sign, however, we decided to chance it. There was some tree work being done, but they let us walk through. Thank goodness for small favors. 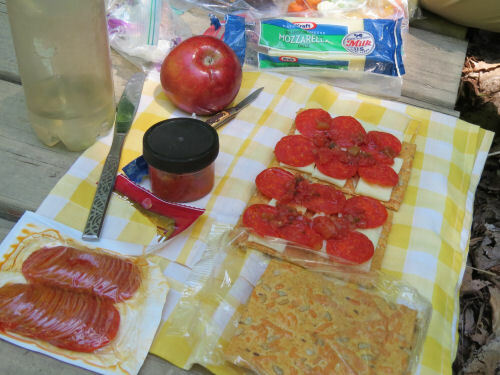 I don't want to duplicate what I had posted on Facebook, but this was the day we stopped for a snack at Willey Creek where the trail passed under Mills Road and Chagrin River Road. That really was a nifty place. We watched the sun play on the water, and listened to the birds. We could barely hear the traffic over our heads. I love being in "secret" places like that so close to civilization. Here's another example of that. 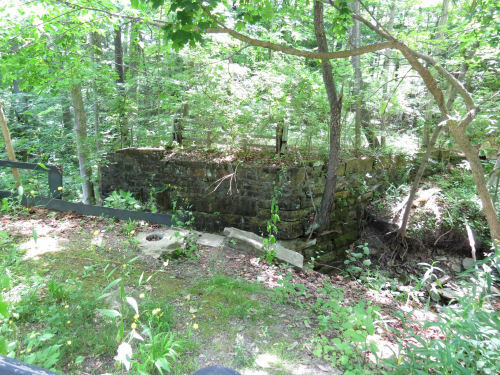 As we walked on trail beside Chagrin River Road, just to our right was a stone bridge abutment on the other side of a creek. 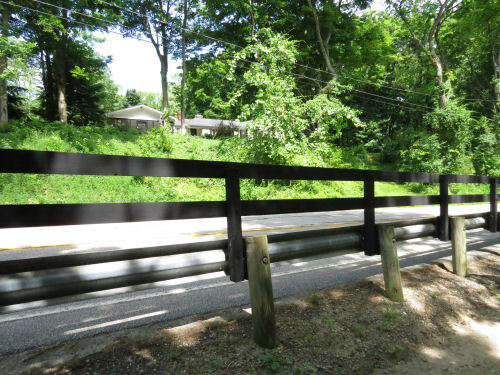 You can see a barrier at the end of what used to be a road that crossed the creek and came into Chagrin River Road. Then look to our left. Nothing but a guardrail, paved road and houses on the other side. I always wonder if people even are aware that there is something historical hiding in the woods, just hidden by some tangled vegetation. The joke of the day was also on us. It seems that all the directions on the map between points 12 and 14 are written backwards. We were fine following blazes until we were past 13 and I decided to read the words. Then I got pretty confused and I started to make us backtrack. Stopped, thought about it. Looked at the map. Looked at the GPS on the phone. Decided we had to be going the right direction. Thankfully we didn't re-walk more than about half a block. Weird. We finished early and called the reporter. It seems I had misunderstood, and he didn't want to meet with us until 5:30 anyway. 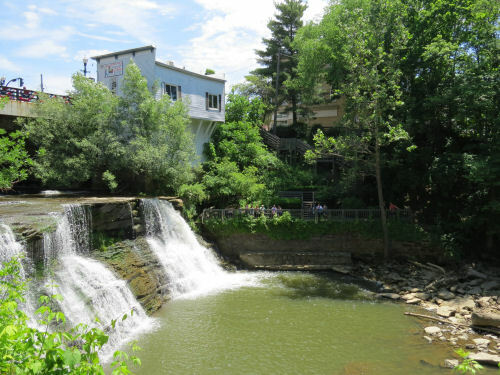 So we drove a few miles to the town of Chagrin Falls where one can see... 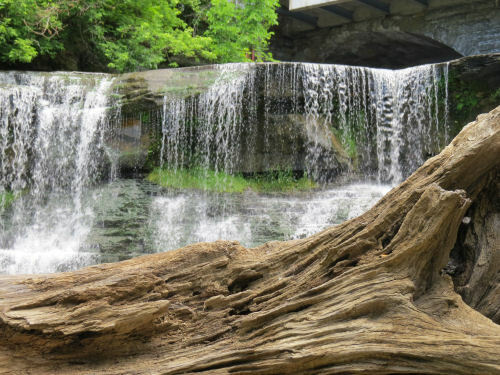 Chagrin Falls. The picture I shared on Facebook is from the south bank. This one is from the north and puts the falls more in the context of the town. We ate our lunch on one of the little bench nooks of the walkway, then played on the rocks a bit and treated ourselves to ice cream. "Chagrin" is an Americanization of the name of Francois Seguin, a Frenchman who traded in the area as early as 1742. By 1850, this falls was powering 14 mills in the town. It was an interesting place. For local people this analogy will suffice. It was a lot like Pentwater without the beach. The town was full of tourists, little crafty shops and humming with summer activities. I wouldn't have thought a waterfall, even a nice one, would be enough attraction to spawn that much commerce. But apparently it has! I tried to get artsy with this picture. Not sure I really succeeded, but it's my best shot. I guess I haven't told you much about our evenings. We like them quiet. We cook our dinner (as you saw in the packages beforehand), then play our games until we are pretty tired (outside if the bugs aren't bad, or inside if they are). We then read a few chapters of a book out loud. Most trips we have something with local history, or hiking lore. This time, we had tall tales from the Catskills. Not a close match for our location, but it was what we came up with. Then we either talk a while or fall right asleep! Total so far, 72.3 miles- over halfway and the top of the T is done. This was the fifth hiking day (Sunday), and we took it out of sequence. We did this because Monday needed to be short since a reporter from the Stow Sentinel wanted to meet with us. There were a lot of road miles in this section and we knew we could do those fast. 13.6 miles to be exact. This connected us to where we began last year's hike. See 134 Buckeye Miles. The day's hike was defined by the Chagrin River. 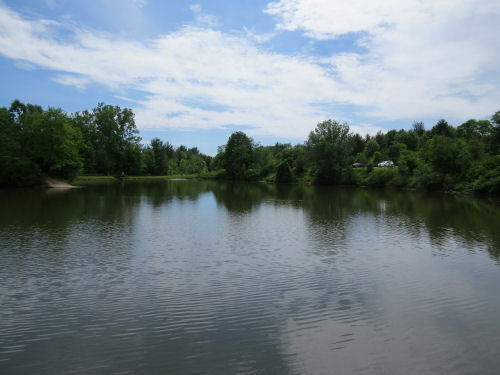 We began at Chagrin Boulevard Field where the Bridle Path/Buckeye Trail headed off along the river. Although in general, I don't think horses and hikers mix well, we saw only a few riders and we managed to not spook any of the animals. Obviously others use this trail too. 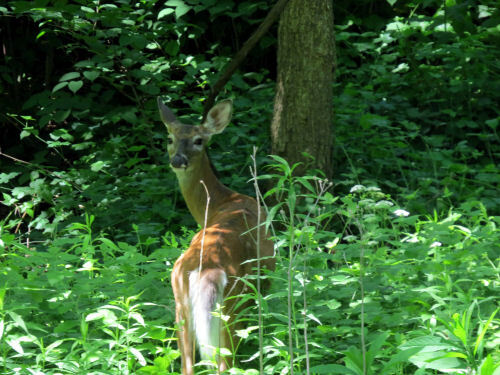 We did have about one trail mile in the Forest Ridge Preserve, and saw this lady, who is obviously very used to humans. Next we walked through the village of Gates Mills, established about 1840. 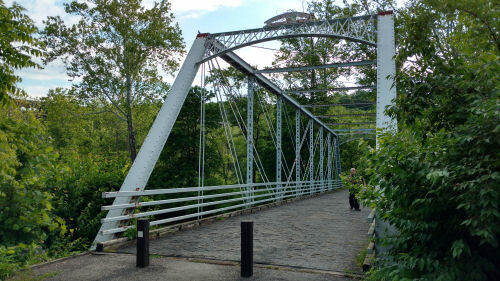 The trail uses another iron truss bridge to cross the river. This bridge was something of a mystery. It looks like a railroad bridge, but on the north side there was no where a railroad grade could have gone. Perhaps it was a narrow road bridge. Perhaps it was moved there to be a footbridge. No one we asked seemed to know. Puzzles like that drive me nuts. The only sign on the bridge said it was made in 1899 by the New Columbus Bridge Company. 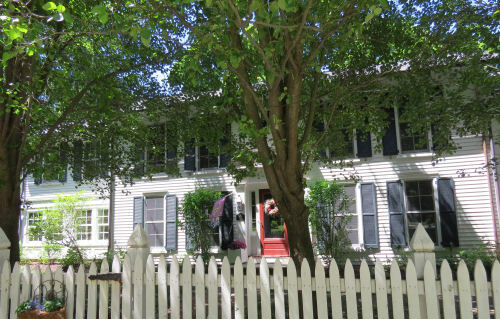 Here's one of the historic buildings we walked past in Gates Mills. It's the Sheldon-Higgins Tavern, established 1840. It's now a private residence and very nicely kept up. 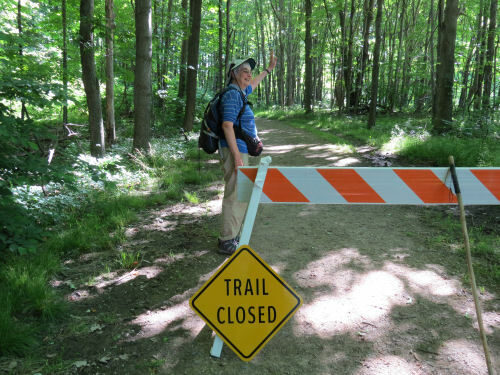 We continued into the Chagrin Reservation for a few more trail miles. We ate lunch on a bench (nice treat). But the joke of the day was on us. Just a few steps farther on we could have had a very, very nice private and cool lunch spot. 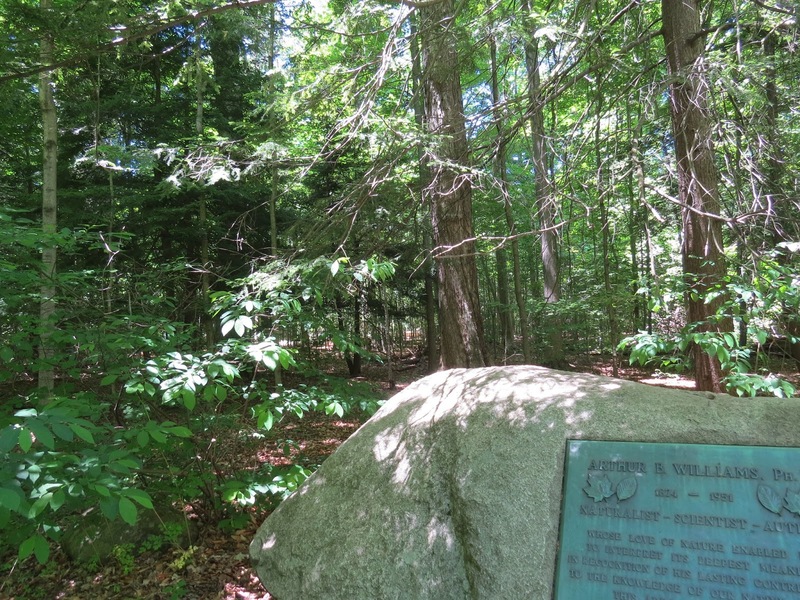 There was a little grotto with paving stones and a larger bench, with a marker commemorating Arthur B. Williams, a naturalist who helped to develop and preserve these woods. 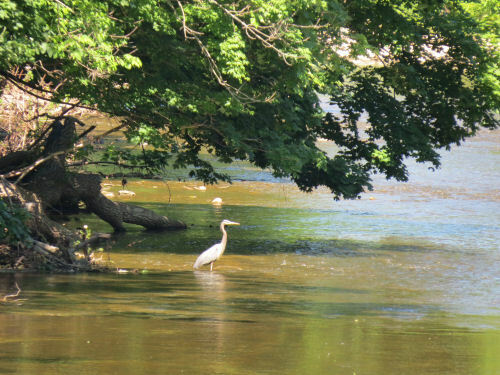 After lunch we trucked out the rest of the road miles, stopping at another crossing of the Chagrin River to watch a blue heron (we saw lots), and we finished our miles before 3 pm. This was our fourth day of hiking, and we did even more miles, 14.6 to be exact. I know this is how some of you feel about long hot walks. You have trouble seeing the recreational appeal. I was excited, though. The very first thing we did was to cross the Cuyahoga River on the historic Station Road Bridge. It was the old road bridge, built in 1881. 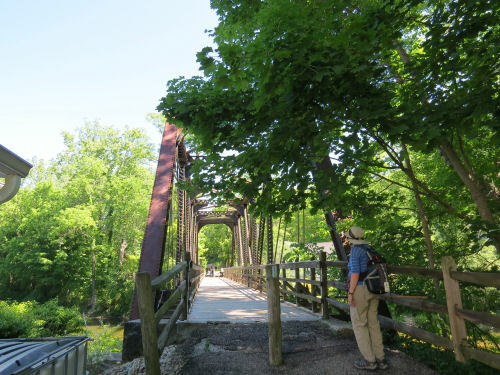 It's the oldest metal truss bridge remaining in the Cuyahoga Valley. This is wrought iron, which had a brief heyday between wood and steel in bridge-building materials. In 1992, it was disassembled, shipped to Elmira, New York (near my original stomping grounds), refurbished and sent back here to be reassembled. Now it's a trail bridge for hikers and bicyclists. Then we began the first of many miles we would walk alongside the Ohio and Erie Canal. This is supposed to be the longest section that is still watered. All the waterways were somewhat muddy because of rain during the night. But it was still a very pretty walk. Oddly enough, here on the top bar of our T we followed it north. 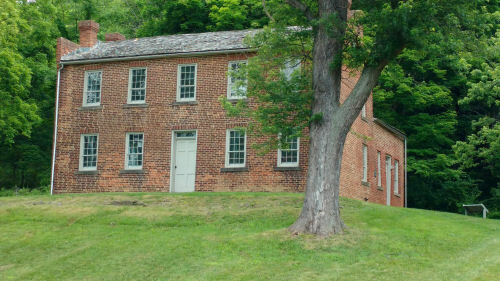 Later all the other miles along it will be southward when we do the tail of the T.
This is the Frazee House, built in 1826, the year before the canal opened. It was a private residence, although perhaps it served as a tavern or inn. It was closed to the public when we were there, so I can't tell you more. As I have mentioned, there are many, many buildings from this era in the area, easily identified by the design. Here's the joke of the day. 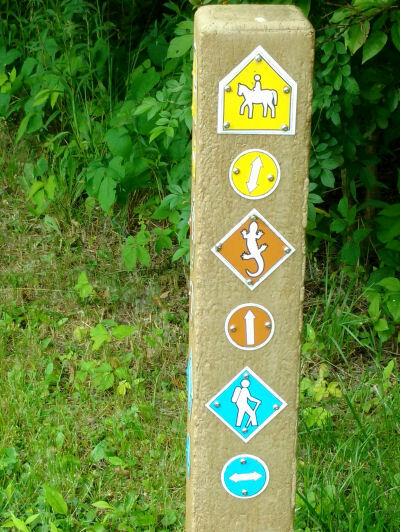 If the yellow emblem indicates a trail for horseback riders, and the blue one a trail for hikers (in Buckeye Trail blue), does the orange emblem point the correct path for salamanders to take? Back to the trials of hiking. Not. We were living the cushy life on this trip. 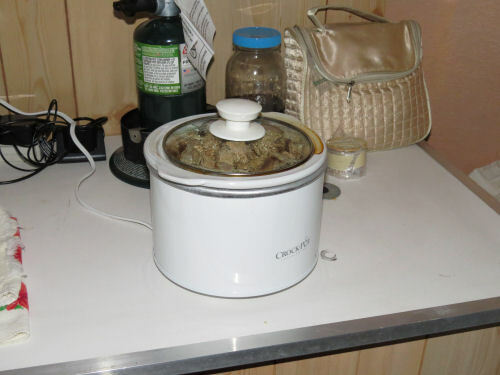 Dinner awaited us in the crockpot when we got back to the campsite. Note the jar of tea, only needing ice from the cooler, propane stove, toiletries kit (not backpacking pared down) and a countertop to set it all on. We are livin' the life, I'm telling you. Marie's feet were still bothering her, so she soaked in a tub of ice water. Another luxury not an option when backpacking. Cold streams are the best you can get there. 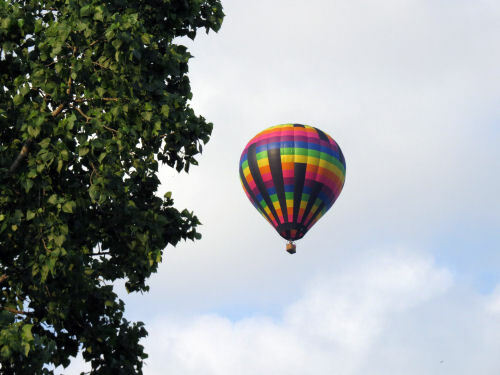 And for the final ta-da of the day, a hot air balloon sailed over the campsite! Well, you know that wherever the logistics fall along the primitive/cushy curve, I'm a happy camper. On day three we stepped up the pace and did 13.9 miles. The weather was still pleasant (as in not too hot), and we wanted to shorten another day. Again, we began the day with road walk. That's fine with us. We can really chew up the miles on roads when we are fresh, and then enjoy cooler woods and a slower pace after lunch. Even though it was on a service road, this walk through Rising Valley Park was very nice, and there was no traffic. Around eleven o'clock we joined a bridle path that had been "worked on," maybe the previous year. This was probably the most annoying couple of miles on our entire hike. The strip had been bulldozed and then left to regrow. It was horrible walking and I'm sure no horses are using it until it's fixed. 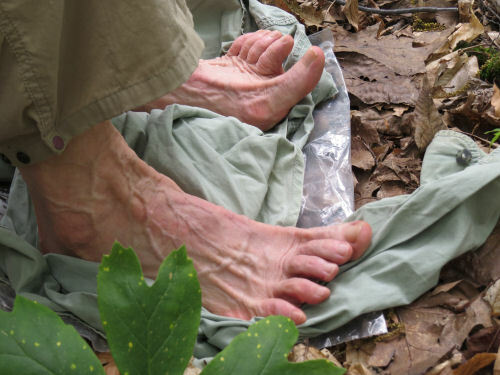 The result was hot sore feet, which can be let out for a breather at lunch. I shared the post of lunch on a log taken this day on Facebook, but I'm trying to show you new pictures as we go through the hike here. 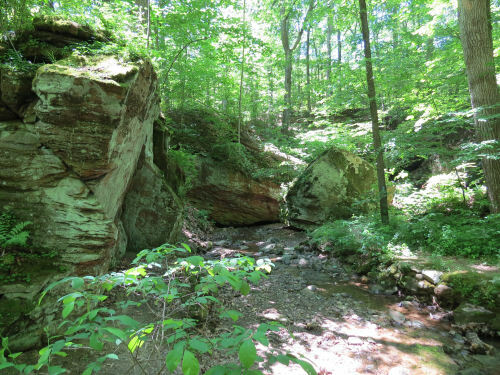 Soon after lunch, however, we entered Brecksville Reservation- part of Cleveland Metroparks- and the trail became really nice again. We met a pair of hikers who volunteer with the park. 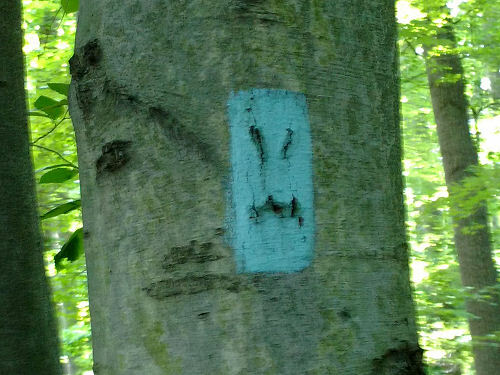 They are one team of many who hike the trails checking on hikers. They carry extra water, and first aid kits, and have information and maps. They encourage people they find, provide aid if needed and (I'm pretty sure) watch out for vandalism and infraction of rules. But it was nice to see that the parks are trying to be helpful. After that, our route roughly followed Chippewa Creek. Lots of nifty rocks. 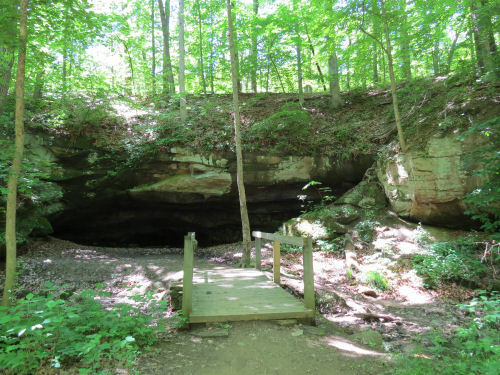 Next, we arrived at Deer Lick Cave. 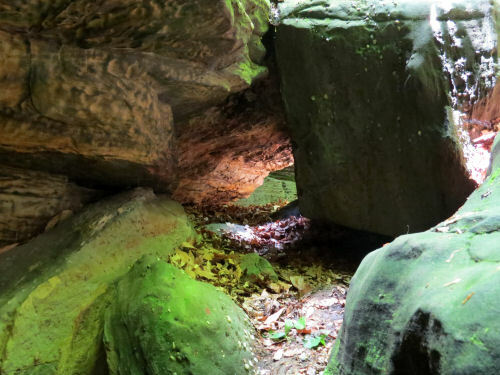 It's a shallow cave under an overhang of Berea Sandstone, which we saw a lot of on last year's hike. 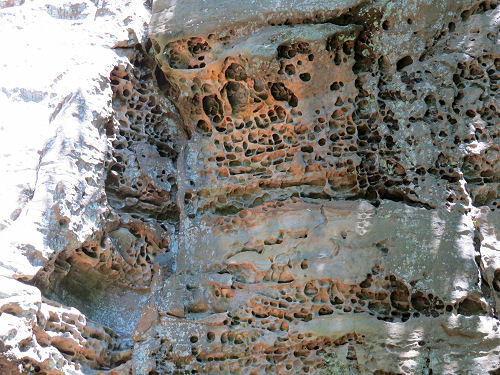 Because the sandstone was formed from ancient ocean shores there is salt embedded in the rock which leaches out when it is wet. Deer lick the rock to get salt. 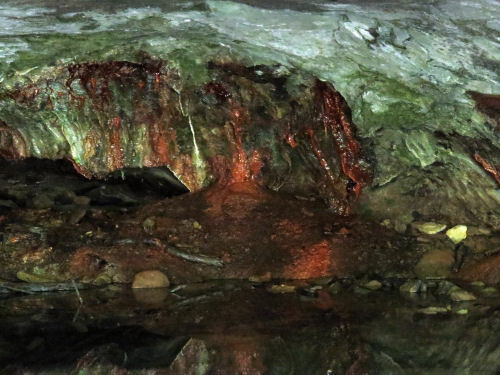 Deep in the cave it looks to me like there are leaching minerals painting the surface in the same way you see at Pictured Rocks of Michigan. You did see this picture in a previous blog post. But it's the significant trail definition of this hike. 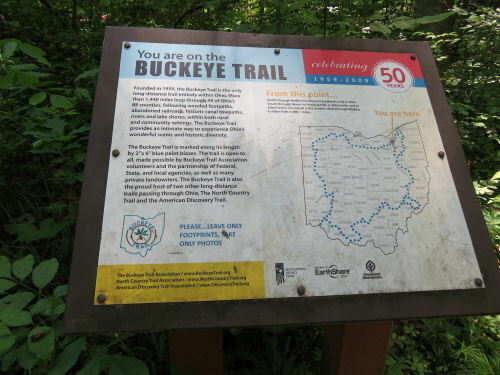 We passed this triple point of the Buckeye Trail. Because we are completing a loop we started last year, and adding an extra piece, the hike ends up being shaped like a T. This is where the top and tail of the T meet. Early in the hike we did the crossbar, then we came back here and hiked south on the tail. Total miles at the end of day 3 is 34.3. This was hiking day two, June 8. 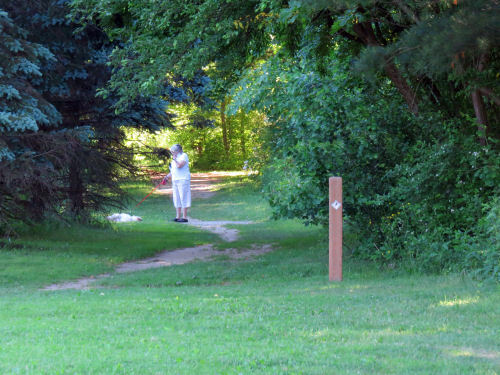 We were still on the Buckeye Trail Medina Map, between points 17 and 23. About the first half was roadwalk. We always find interesting things to look at even so. I loved this hosta garden. I have six or seven varieties, but not as lush as these, and not filling an entire space. 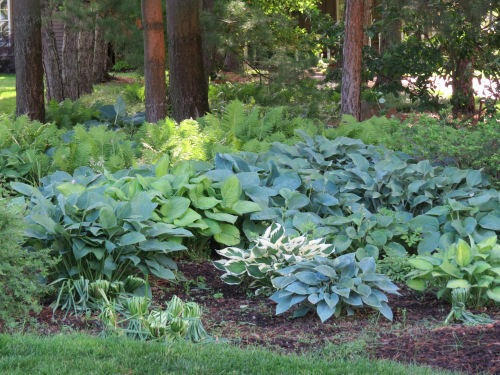 There are so many hostas you really can create a lovely shade garden with them. Another interesting thing about roads is that there are often historical places to see along the way. Here's one you'd never notice from a car unless you stopped particularly to see it. I've continued to be amazed at how early northeast Ohio was settled. This was partly due to the Ohio and Erie Canal opening in 1827. There will be lots more about that later. But here's a stone watering trough at Weymouth. 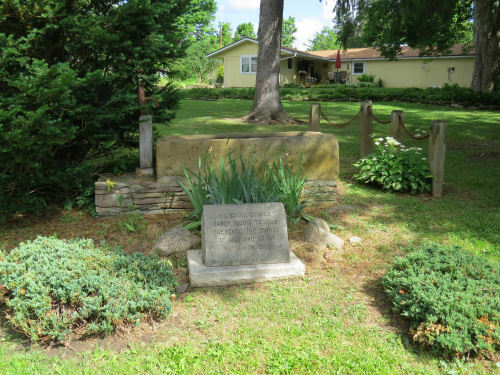 The monument says that it was in use from the early 1800s through 1926. 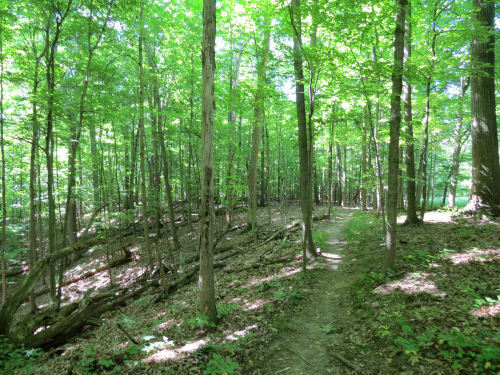 The afternoon was spent on trail through Hinckley Reservation. I've shown you a couple of pictures of this place known as The Ledges or Whipp's Ledges, but it's worth a few more. This area is definitely more like southeast Ohio or even Pennsylvania. 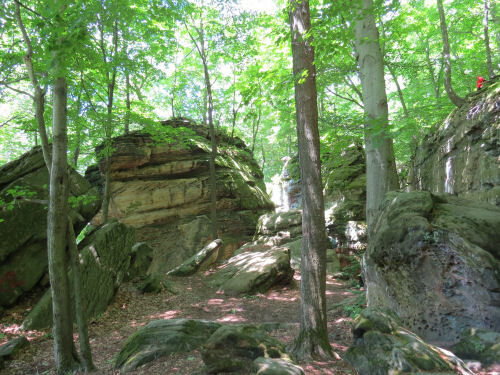 There are huge outcroppings of the Sharon Conglomerate sandstone which overlies shale. Most of Ohio was glacially scoured and covered with till when the glacier retreated. However, this is one of the places where the original bedrock remains. It's a popular spot for rock climbers, and we hung around for a while watching one guy prepare, but he was still getting ready and we needed to move along. You can see a person in an orange jacket on the top right. The sandstone is soft and I love how some areas become honeycombed over time. This was my lucky shot, however. There was a tunnel between sections of rock, and the late afternoon light was shining through. What the camera saw is even better than my eye. 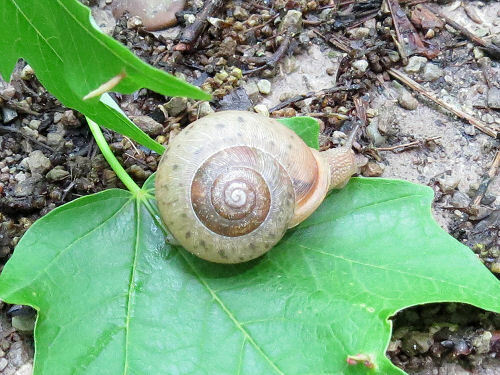 Just for a sense of scale- in addition to immense, we also saw this tiny one taking a hike. This, however, was the big joke of the day. First the picture, then why it's so funny. 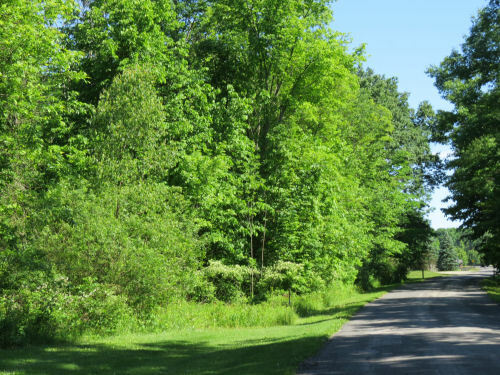 This is trail along a service road as we were leaving Hinckley Reservation. The guide says that at 1290 feet above sea level, this is "perhaps the highest point on the Buckeye Trail." We had a good laugh about this. I'm sure it might indeed be the highest elevation, but it's certainly not much to look at! Good thing we read the words, or we'd never have known it was such a special place. 11.4 miles for the day. Pretty Much Ready to Go!